This walleye was taken illegally from the Rainy River during the spring spawning season. A TIP caller witnessed a poacher stuff it in a boat compartment. Throughout our website you will find photos of animals that have been taken illegally. Each have a story. The cost of poaching is not always monetary. Taking fish and game in excess or without fair chase is theft to all Minnesotans. This buck is on display at Downtown Meats in Bemidji. This is a part of our Wall of Shame program that helps in our deterrent effects. Officer Tyler Quandt received a call from a citizen telling him that a Red Wing, MN man had shot two bucks on opening weekend. Within two minutes of receiving this call, a second person called stating the same story. In addition to losing the deer, the violator lost his Winchester Super-X 3 shotgun and paid fines and restitution. Neither of the Complainants wanted a TIP reward, they were just happy to see the violator get held accountable. Expenses related to this mount were sponsored in part by Jones Taxidermy. A TIP call was received regarding the illegal taking of a huge racked whitetail buck near Swanville, MN. The 191” non-typical buck was taken from a farm implement (combine), using a rifle in a shotgun slug only area, and with no deer hunting license. The defendant was charged and convicted of the crime. This person received a $1,500 fine, loss of big game hunting privileges for 3 years, loss of his firearm, and also the deer mount. 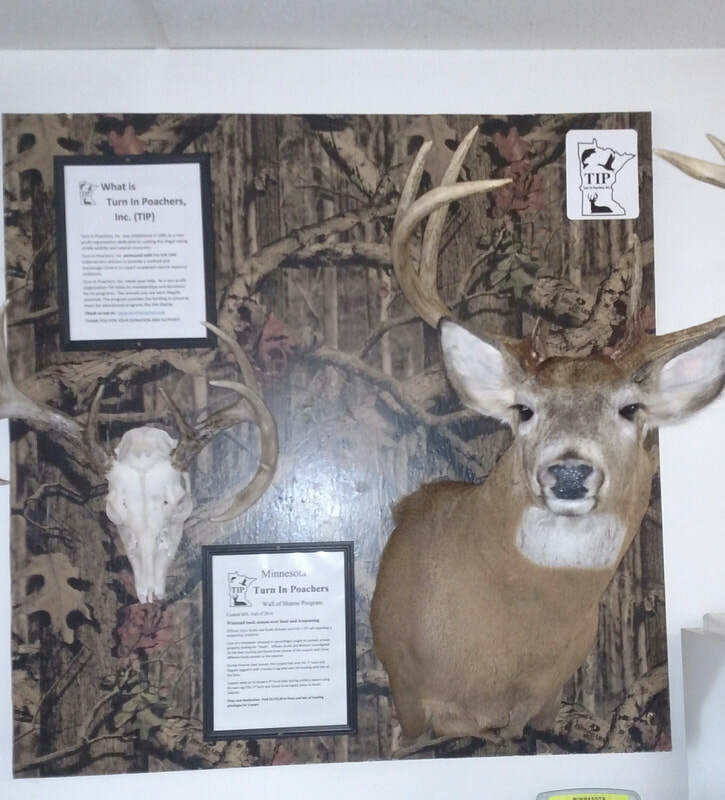 This buck is on display at Hunts Point Gun Club near Pequot Lakes. It is viewed by many patrons with the hope of creating additional deterrent. Officers Joyce Kuske and Keith Bertram received a TIP call regarding a trespassing complaint. Case of a trespasser (dressed in camouflage) caught on posted, private property looking for “sheds”. Officers Kuske and Bertram investigated his fall deer hunting and found three photos of the suspect with three different bucks posted on the internet. During firearms deer season, the suspect had shot the 1st buck and illegally tagged it with a hunter’s tag who was not hunting with him at the time. Suspect went on to arrow a 2nd buck later during archery season using his own tag (The 3rd buck was found to be legally taken in North Dakota). This display is located at the Ramey Store in Ramey, MN near Little Falls. We that Arlan and his staff for supporting the program.